Within the United Arab Emirates (UAE) is Dubai. Dubai is the largest and most populous city within the UAE and it is making itself known in the world. Dubai vacation rentals have taken off and have an amazing reputation. The city is a major transportation hub for both passengers and cargo and has been busily constructing some of the world’s most unique architecture. More and more people are choosing Dubai as their vacation spot for the ease of logistics the city offers. So many attractions are all within a close proximity. Guests don’t have to lose lots of time trying to get from point A to B. This is one reason families are enjoying making Dubai their vacation choice. Burj Khalita: This building is famous because it is the world’s tallest sky scraper. Rising up into the sky 160 stories this is one very tall building. As you can imagine it can be seen from various angles all around the city. One of visitor’s biggest issues is trying to capture the whole thing all in one shot. If you are keen, there is an observation deck that is open to the public and is a cool thing to check out. Burj Al Arab: Known for being built in the shape of a sail boat this is another famous building in Dubai with a stunning back drop. A night’s stay at this hotel carries a pretty hefty price tag and as such it is often referred to as a seven star hotel. None the less, you don’t have to stay there to get a picture. A trip to the Dubai Mall is a must experience during the time of your stay. This mall is just huge. Split up into several sections there is a huge variety with hundreds of different shops and restaurants to choose from. If watching movies is a hobby you enjoy you are in luck. There is a 22 screen multiplex movie theater within the mall too. An aquarium, ice skating rink and entire theme park called Sega Republic are also inside. Most visitors say they spend about a day wandering around and looking at all the different things, although some people do visit a few times. If the weather is too hot for your liking outside, you can still burn up the calories by doing laps inside the mall. 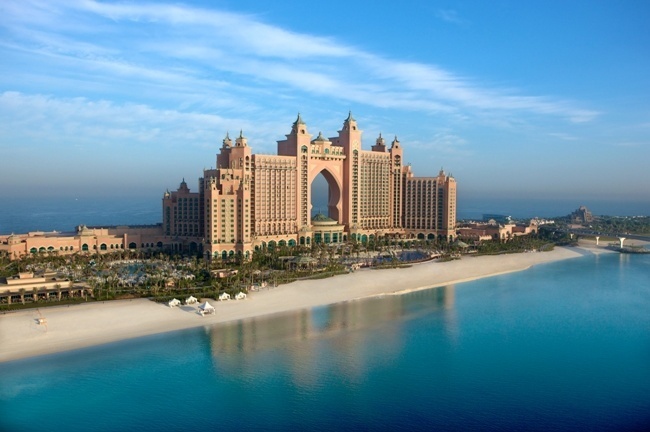 Located at the luxurious Atlantis Palm Hotel is where visitors can go to find The Lost City of Atlantis. You don’t have to be a staying guest to go. Visitors can wander around the underground grottos and look at the aquariums with lots of different fish species. There is also an Aquaadventure with water slides that both kids and adults enjoy. No matter what you do while you are there it is a bit of fun to be able to say you went on vacation and saw the Lost City of Atlantis. Dubai is setting the bar high and making itself known for being a place of luxury. People looking to treat themselves can indulge in all sorts of nice things, such as stellar digs to stay at. Many savvy travelers are veering away from the traditional hotel bookings and instead opting to rent a private place for themselves. Those traveling as family or in a group of friends can find this a surprisingly affordable option. Other ways people use this option to their advantage is if they are looking to have a staycation. When you have a really nice place to relax at, then there is little to no need to leave. If you are looking to unwind this can be a great way to achieve that goal. Every evening at Burj Khalifa Lake the Dubai Fountain puts on a free show. The lake is a 30 acre man made area to impress. This is also the world’s largest dancing fountain. Each evening 1.5 million lumens of light and color are projected onto shooting water spouts. Some of these spouts go as high as 50 stories making it quite a show. Synchronized music and water move together giving an artistic and display to all the onlookers. Golf courses, tennis courts and sports complexes are a thing in Dubai. If the weather is too hot for your liking, you can go indoors to play basketball, tennis, football to beat the heat and still get your exercise. Dubai also has been holding a variety of golf, tennis, polo and cricket championships. The Nad Al Sheba racetrack is a favorite attraction between both locals and tourists alike. As you are planning where to use your next precious vacation time, keep Dubai at the top of that list. With so many activities so close and such an easy place to fly into, completing this trip will be a breeze. Kevin Payne is the author of this article. If you are looking for a Health consultant, Kindly Read all the stuff of this author.